Floods are a major concern in many parts of the world, yet data and knowledge on their extent and impact simply doesn’t exist for many regions. This includes places where people are highly exposed and vulnerable to flooding, such as many urban and village communities in Indonesian Borneo. Flood regulation by native vegetation is widely viewed as an important ecosystem service, but it is extremely hard to estimate or value this service when whole regions have little or no data on the impact of floods or their frequency. We sought to fill this information gap for Indonesian Borneo by documenting where and when floods occur, how they affect local communities, and how they relate to forests and other ecosystems in the surrounding landscape. To gain insights into these questions, we developed two new and independent sources of information – village interviews and news archives (Wells et al, 2016). Interviews with village leaders in 364 villages enabled us to estimate the frequency of recent floods (during the past five years), and whether this had changed over the last 30 years. Floods were defined as inundation of the main road or path at the centre of the village, in order to encourage consistency of recall and to reduce possible changes with population size over time. We also collated all news reports of flooding from the archives of 16 news agencies over a 3 year period (April 2010-2013), to show where flooding occurred and estimate how many houses were flooded and people displaced. We found that flood impacts are far more frequent and widespread than government risk assessments have estimated. Many individual flood events were large and affected thousands of people, but we also found that more frequent, local, events can have large cumulative impacts. For example, 58% of villages experienced one or more floods every year over the last 5 years (and only 10% of villages reported no experience of flooding in recent decades). Over the 3 years we examined, local news agencies reported floods that affected 868 settlements, 966 times (including 89 in urban areas), inundated at least 197,000 houses, and displaced more than 770,000 people, possibly as many as 1.5 million (which is between 5%–10% of the total population). When asked about changes in flooding over the past 30 years, floods were perceived to have increased in frequency in around 20% of all villages. In contrast, declines were reported in only two villages (0.8%). Next, we analysed the frequency, trends and likelihood of flooding in relation to features of the surrounding landscape. These features included rainfall, topography and land use in upstream watersheds. Using Boosted Regression Trees to model these relationships, we showed that flooding was related to climate and topography (as expected, eg, more flooding closer to rivers or at lower elevations), but was also related to land uses in the upstream watershed, especially mines, forests, and wetlands. Variables describing land use or land cover accounted for 24% – 30% of the total variance in each dataset. These models also enabled us to map predicted patterns of flooding across Indonesian Borneo (see Figure 1). Recent flood frequency, and the likelihood of a trend (perceived increase over the past 30 years), were both higher for villages closer to mines (up to a distance of 80 km from open-cut coal or gold mines). 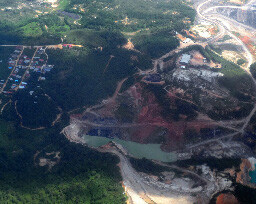 The likelihood of a trend was also slightly higher in watersheds with higher cover of oil palm plantations. Conversely, both were lower for villages in watersheds with higher cover of natural wetlands, peatlands, intact forests, or selectively-logged forests. News-reported floods were similarly related to upstream land covers, especially wetlands and peatlands, and were also more likely in watersheds with higher impervious cover. The independent data sources (from villages and news reports) together give strong evidence of widespread and frequent flooding. They also revealed many similar relationships with aspects of the landscape, giving maps with similar areas predicted to have low or high flooding hazards. Figure 1: Map of news-reported floods and modelled flood probabilities for populated areas of Kalimantan. Points show the locations of 380 news-reported floods over the period April 2010 – April 2013. 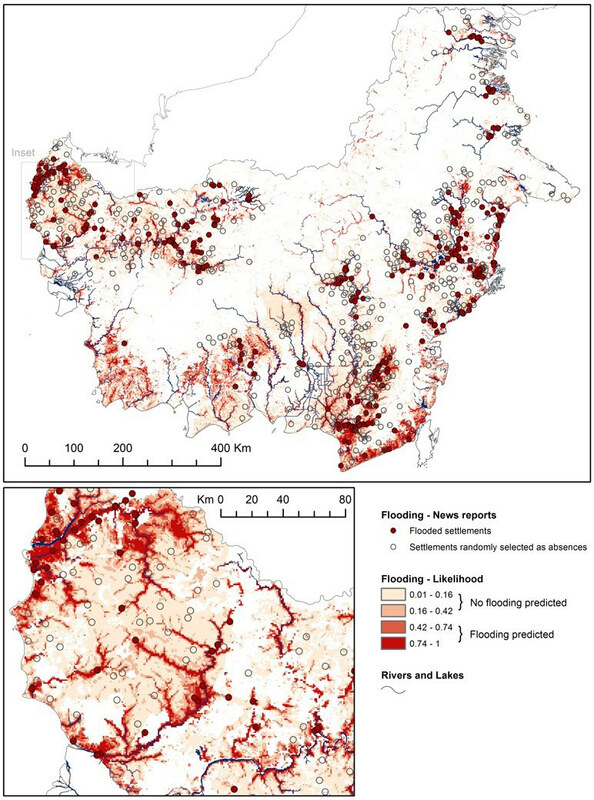 Predictions were generated for populated areas from modelling that related the presence/absence of reported floods to 35 environmental and socio-economic variables. These findings indicate the large potential value of further research to understand how these land uses alter flooding hydrology, including the effects of specific management systems for logging and plantations. Such research would enable quantitative projections for flooding hazards under alternative land use and climate change scenarios. 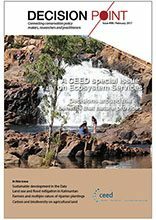 This research has demonstrated how novel information sources can be combined to assess flooding patterns in data-scarce regions, and highlights the need for more comprehensive assessment of flooding risks to inform land use decisions, as well as options for ecosystem-based adaptation to climate change.